"How to create a launcher for an application". In few application's we'll find no application launcher will be installed or copied in to the system. For example here we'll take MATLAB as an example. To open such type of applications we have run the required binary file in the terminal. In my previous post (click here for that) i have explained how to get it done automatically by downloading and copying the files which are prewritten. Here we shall see a simple script for doing the same thing without downloading anything. This helps people without internet. For doing this we require a text editor and an icon image. This is common for any application launcher creation. Step 3: Move it to the appropriate location "/usr/share/applications/"
use cp command for that " cp /<present locatin> /usr/share/applications/"
Step 4: Download the required icon image and place it in "/usr/share/icons/<filename>"
for matlab logo you can get in installed folder "/Matlab/toolbox/sl3d/mainpage/matlab_logo.gif"
That it we are done. 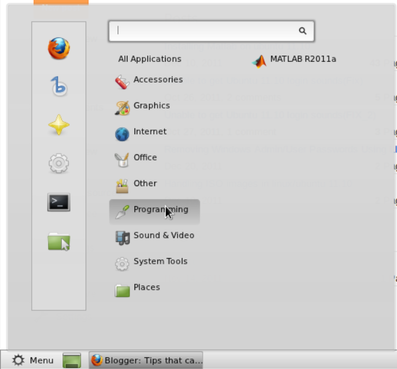 You can see it the dash for ubuntu user s and for linux mint user go from the menu-> development- >matlab or from the dash. Thanks, this has helped me to make my own launcher for matlab. All I had to do that was different was change the icon location, but no big deal. Work in ubuntu 15.10! Thanks!! !